Rigaku nano3DX is a true X-ray microscope (XRM) with the ability to measure relatively large samples at high resolution. This is accomplished by using a high powered rotating anode X-ray source and a high-resolution CCD imager. Watch the video here. The laptop showed that the qPCR machine is connected to the laptop. However, when we open the software, the cycler status is not available (play button is grey). We restart the machine or laptop several times, and it doesn't work. What is the problem with our machine? Advise this member. I'm currently using the R spindles with the Fungilab Expert Series, but the results are given in R.P.M and not in shear rate values. In the manuals there isn't any conversion equation, anyone has the equation or a conversion factor that you can send me? Advise this member. I cannot find how to change reagent bottle position in the AU480. Please advise. Advise this member. Thermo FOXBORO Miran SapphIRe 205 A/B is an infrared ambient air analyzer for multicomponent analysis. It is designed to measure over 100 preprogrammed compounds of which it can perform multi-gas analysis on 10 user selected wavelengths. The MIRAN SapphIRe Ambient Analyzer offer a unique design allowing for rapid and accurate wavelength selection. Normalization Assistant allows everyone in your lab to create fully automated DNA or RNA normalization protocols on PIPETMAX®. By automating the tedious calculations and sample tracking tasks required for normalization runs, Normalization Assistant brings effortless traceability and reliability to your DNA or RNA normalization sample prep while performing all of your normalization sample prep for you. Read more about the Normalization Assistant on the Gilson website. So, the time has come to replace that aging instrument sitting in the corner of your lab; the problem is, with only a handful of real market leaders and dozens of cheaper off-shore instruments, how do you select the instrument that best suits your needs? While many labs may still be using systems from the 1970s, technology has changed and improved considerably for these work-horses of flame-emission spectroscopy. Current systems offer a wide range of elements, autosamplers, custom optic arrays and simultaneous detection across a whole range of elements making the decision rather tricky. Bio-Rad Laboratories Inc. (NYSE: BIO and BIOb) today released the One-Step RT-ddPCR Advanced Kit for Probes which combines reverse transcription and Droplet Digital PCR (RT-ddPCR) for absolute RNA quantification. Delivering increased PCR efficiency, specificity, and sensitivity, this improved single-format reaction enables enrichment of rare target RNA sequences and detection of small differences in gene expression levels. Read more. Developed as a result of users’ demands for an evaporator that could quickly process large-volume environmental samples in parallel without supervision, the Rocket Synergy Evaporator can concentrate or dry 18 ASE tubes or up to 6 large-volume 450 ml flasks. This enables the user to focus on other tasks, confident that the Rocket Synergy Evaporator will achieve reproducible evaporation with excellent recovery rates. Read more. Shimadzu Scientific Instruments (SSI) announces the U.S. release of its LABNIRS functional near-infrared spectroscopy (fNIRS) system. LABNIRS offers multi-channel, high-sensitivity optical measurements of blood oxygen level dependent (BOLD) signals that originate in the cerebral cortex. Shimadzu will debut the LABNIRS imaging system at booth 1854 at the annual meeting of the Society for Neuroscience, which takes place October 17-21 in Chicago. Read more. Quadrex, in a joint effort with the Zoex Corporation (Lincoln, NE) developed the first device to simplify capillary column installation. The Capillary Column Quick-Connect was introduced at the 1992 Pittsburgh Conference. The Quick-Connect fitting eased the column installation burden, also saving time and materials. Our close work with Zoex also pioneered early GC x GC instrumentation and column development. Quadrex has established strategic partnerships with other manufacturers for the supply of related products, such as Ultra-ALLOYTM Stainless Steel Columns from Frontier Labs (Japan), full-featured portable GCs from SRI Instruments, gas generator systems from Peak Scientific (U.K.) , and a complete line of GC consumables. With these relationships, we can offer you, the discerning chromatographer, complete GC systems, from consumables to GC instrumentation. I just got my machine running a few minutes ago after a minor circuit breaker repair. For some reason I keep getting the LID error after running the machine at 3200RPM for a couple minutes. The lid is well secured as far as I can tell. Any ideas what the reason might be for this message? Join this discussion. 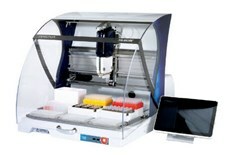 We have Beckman optima XL-80 ultracentrifuge and vacuum is not going below 40 micron. We replaced the diffusion pump oil but it still stuck at 40 micron. What are the other possible reasons for low vacuum? Is there a solution other than changing diffusion pump oil and vacuum pump oil? Join this discussion. We recently acquired a used DU-640, and I've been tasked with getting it functional. It boots up and passes all its initial diagnostics, and at that point, the mouse pointer is in the top left corner of the screen. I'm able to move the pointer all around the screen with the keyboard keys, but I can't click on the option to get beyond the results screen. Is there a unique keyboard shortcut that can replicate clicking the mouse? Neither of the enter keys, the function keys, or control/alt keys seemed to do anything. Join this discussion.